Qatari satellite broadcaster Al Jazeera says that its correspondents in Sudan have had their work permits withdrawn by security officials. In a statement late Monday on the Arabic language Facebook page of its Sudanese channel, the channel said its Khartoum office was told the decision was made after a review of the work of Osama Said Ahmed and Ahmad al-Ruheid, as well as cameraman Badawi Bashir. fILE - A tear gas canister fired to disperse Sudanese demonstrators, during anti-government protests in the outskirts of Khartoum, Sudan, Jan. 15, 2019. A month of protests in Sudan, which began over the failing economy but led to calls for President Omar al-Bashir's removal, has faced a media blackout by authorities, who control the press. 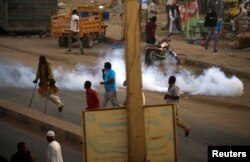 Al Jazeera has been reporting on the unrest and sometimes broadcasts protests live.